It was with some alarm that I learned of the pending demolition of the 1893 Methodist church on the corner of Hillside Rd and Wesley St. The striking red building had always been an intriguing landmark on my regular travels back and forth from town. The decision to tear down the building is not without some contention due to the building’s historic nature, though no article I have thus far seen explains any more about its significance than the date of its construction (which anyone could learn simply by looking at the building). So join me as I take a closer look at this building, and perhaps ponder some interesting questions. 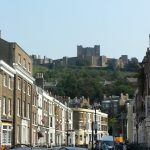 Does age alone define a building as historic? How much ownership can (or should?) the public demand of such a place? By the time I hurried to the location of this highly endangered building, the roof had already been partially removed, causing me to rue the fact that I had until this day taken the place for granted. In my attempts to trace the significance of this building my ignorance forced me to start from the very beginning – what distinguishes Methodism from the myriad other brands of Christianity? Methodism is fairly new, having emerged in the 18th century from the teachings of John Wesley. The movement rejected the idea that a predetermined few would be saved, declaring that salvation was open to all. The religion spread in a grass-roots manner, with meetings held in the homes of common people and women playing an active role in teaching. Eventually Methodism split off from the Anglican church and became an independent religion in its own right, though certainly not without push-back from traditionalists (one of my own ancestors was an early Methodist preacher in rural England, and I hope one day to be able to tell his story, if only because it involves a weaponised chicken). So now we’ve got some idea of the big picture, lets take a look at how the building itself got here. Dunedin as we know was founded mainly by Scottish Presbyterians but Caversham had a slighty higher proportion of English which is possibly why the Anglicans were first to stake their claim in the area with St Peters Church in 1864. Meanwhile, the Presbyterians did not arrive until 1869. 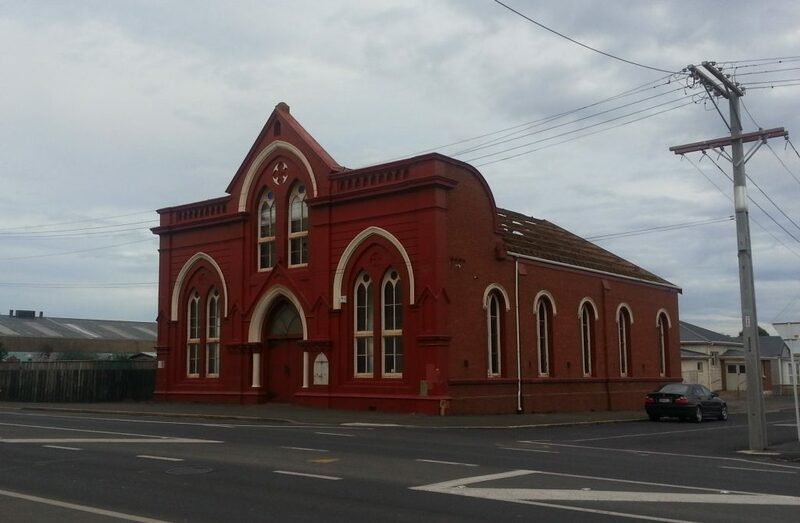 There were Methodist services held as early as 1864 but they were discontinued until a revival in 1880 when two separate groups began holding services, one in the Caversham Town Hall and the other in a cottage in Melbourne St. The two groups united in 1882 and purchased a site half way between their original places of worship for their church. 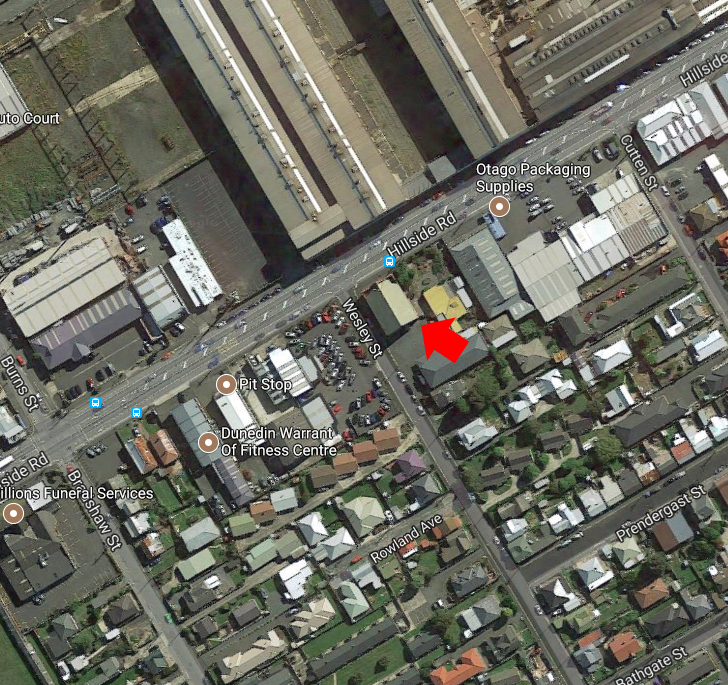 An unused church in Opoho was then purchased and moved to the site, which from what I gather was on the opposite side of Wesley St from the church that succeeded it. 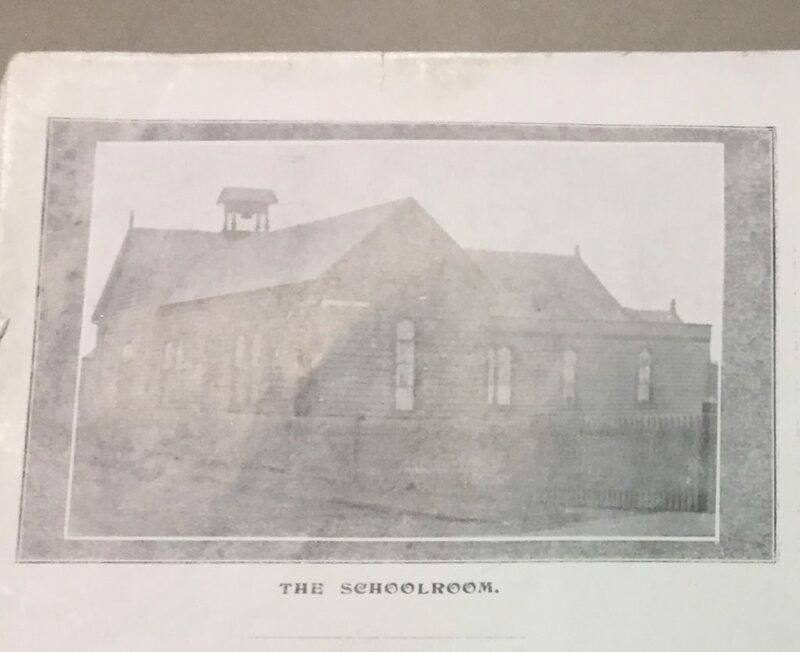 The wooden building was used as a church for eleven years, and afterwards with several additions as the school room until at least 1932. Now it seems that building too is gone, replaced by a car yard. 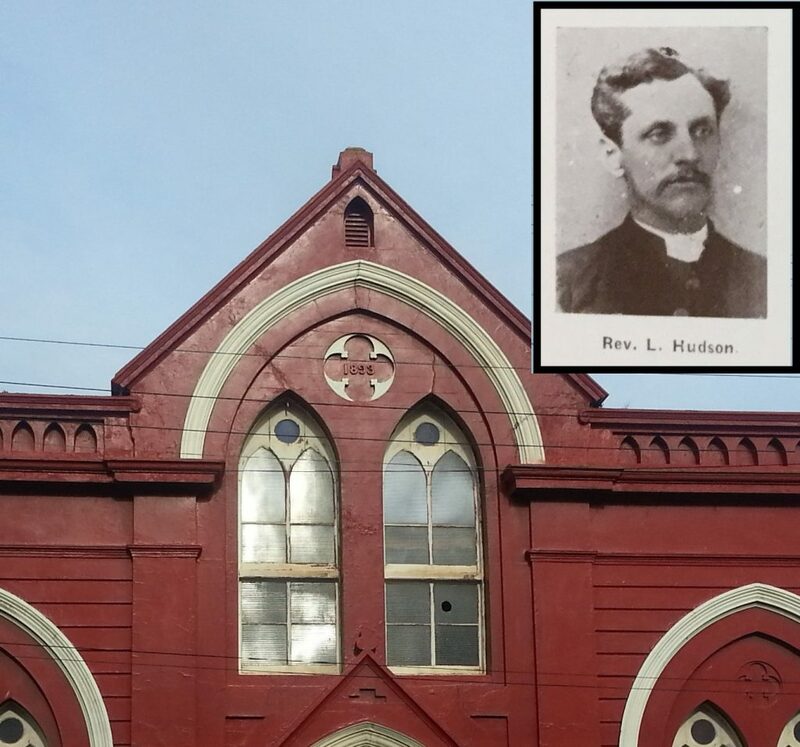 In 1892 the Rev Lewis Hudson became leader of the congregation, an “active and vivacious man” who had an “infectious enthusiasm” and “gift for making things move along”. The new Mission Hall, as it was then known, that would replace the “inconvenient and insanitary” prior buildings was his idea. His first grand plan was for a church that would seat 1000, but that was soon dialed back to the 660-seat version that we have grown to know. On 8 July 1893 a ceremony was held to mark the laying of the foundation stone, attended by many members of the religious community and architect James Hislop. Here I learned a most intriguing thing, for beneath the first stone were placed several coins and papers. Now that the building is coming down, is it time for the secret treasure to come to light? We’ll get to that in a moment. The work of constructing the building was almost too much for the poor Reverend, as the stress caused him to become so unwell that he was unable to even preach in the new church until his farewell sermon at the end of his ministerial service. The Wesley Church of Cargill Rd (as Hillside Rd was then known, which explains the whole “Cargills Corner” business which so baffled me as an immigrant to Dunedin) became the base for a very large circuit which included Mosgiel, St Kilda and the Peninsula. In 1901 a dedicated property was purchased for a parsonage at the other end of Wesley St (or Duncan St, as it was known until 1905), which I managed to locate after a brief search. At least this building does not appear to be in any present danger, though it’s clearly gone through a few changes over the years. 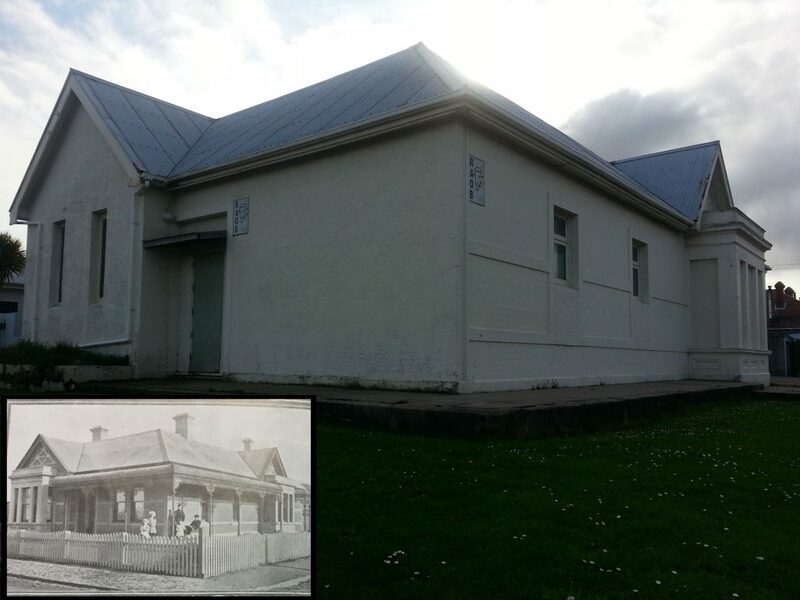 From this peak in the early 1900s to dereliction today, how did things come to this for the trusty old mission hall? Such was missionary success that in 1906 both St Kilda and Mosgiel were split from Cargill St, with St Kilda especially impacting on congregation size. 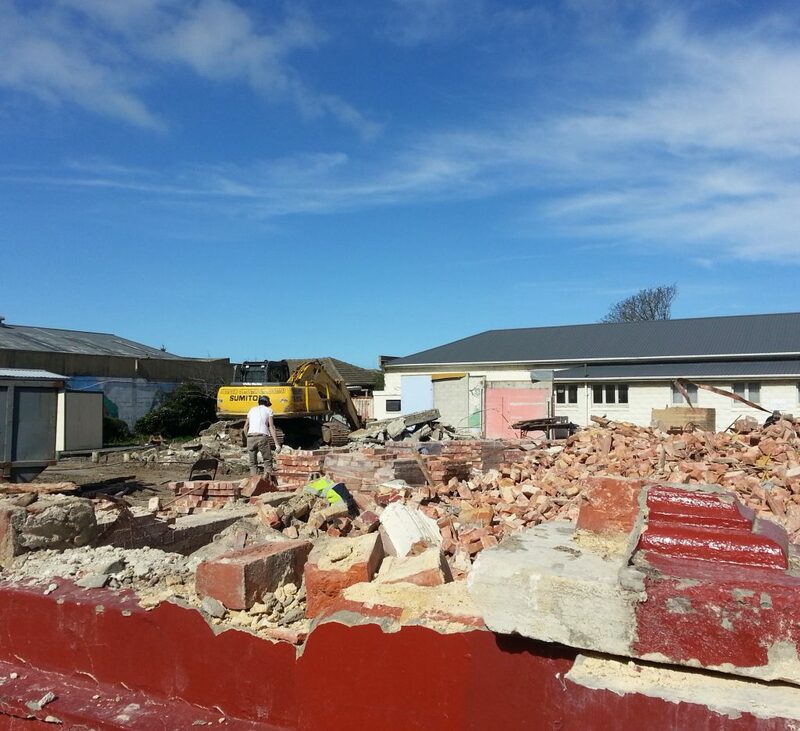 Fast forward to 2009, when the Methodist Mission sought planning permission to build a $5.6 million social services complex on the site, a move that would necessitate demolition of the church. 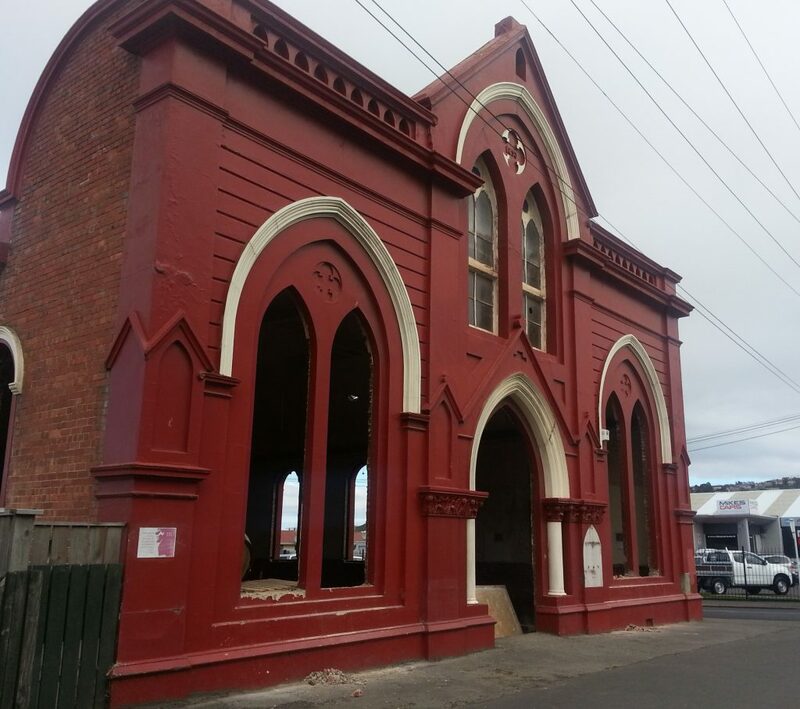 The move was opposed by the New Zealand Historic Places Trust, though the building was not protected by any heritage rules. Thus the values of nostalgia and historical preservation were pitted against those of progress and providing appropriately for community needs. On one hand, the building was derided as ugly, inappropriate for current needs, and next to impossible to bring up to date with modern compliance codes – a liability to any owner. 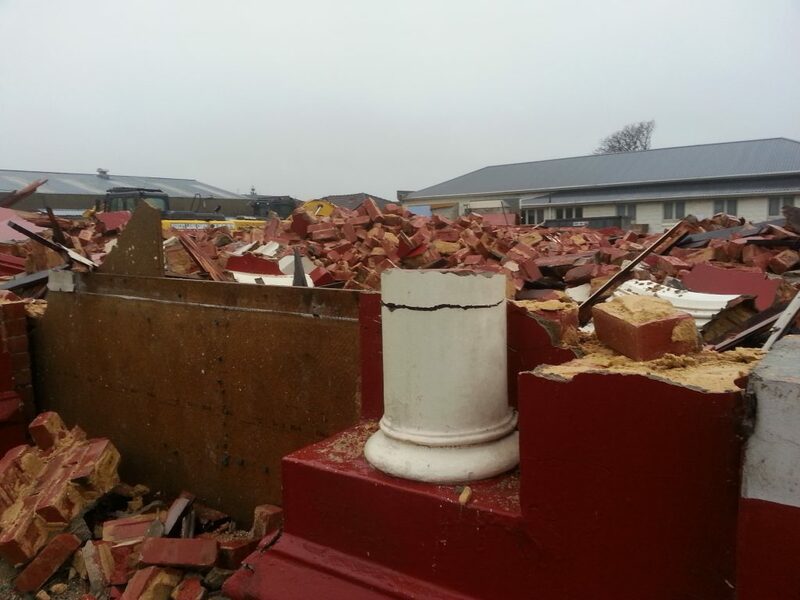 On the other side were fears of heritage loss and accusations of a lack of regard for Dunedin’s religious history. Bizarrely, the Methodist Mission was even accused of not understanding its own values! I can see merit in both sides of the argument. I have a great reverence for historic works and would gladly see each and every one preserved for generations to come. 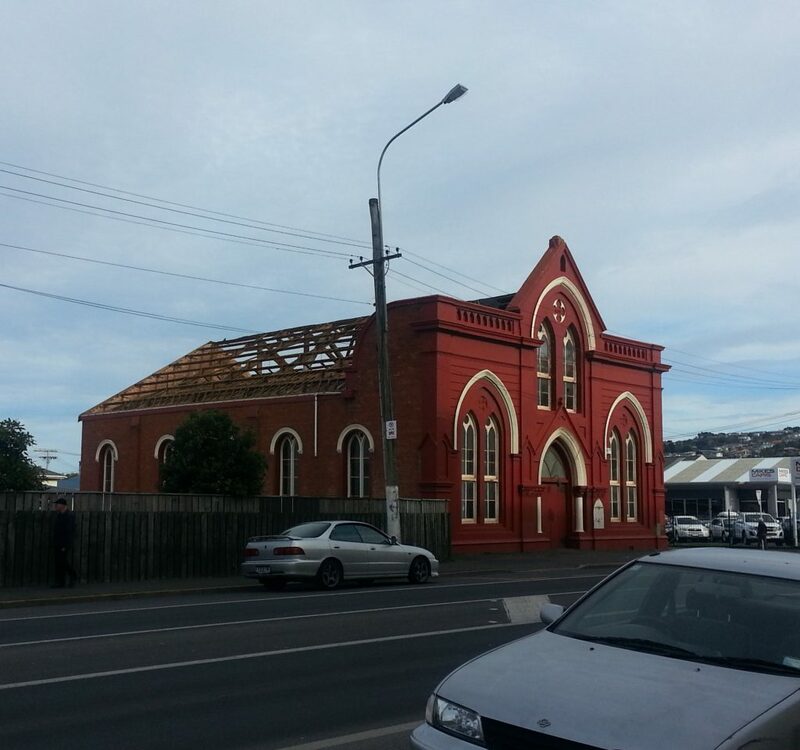 Certainly this building does represent an important period in Dunedin’s religious history. But is it fair to expect the owners of this place to shoulder a great expense that does nothing to further their own ends and in fact may actively hinder them in their goals? At what point does nostalgia and resistance to change blind us to the benefits of discarding the “inconvenient and insanitary” (as Lewis Hudson said in 1893) for the new and improved? Regardless of the answer to these questions, the nay-sayers were powerless to prevent the Methodist Mission from demolishing the church if that is what they chose to do. However plans changed in 2011 when Forbury Primary School was closed and the Mission was able to rent that space for their community services instead – saving them the tremendous expense of building a community centre from scratch. Not that this was to save the unlucky church. In November 2016 the last service was held and the congregation dispersed to other places of worship. The property was sold to developers who have not revealed what the future holds for the site, only that the church must go. I’d hoped to get some shots of the actual demolition, but returned from two days out of town to find myself thwarted. It did appear that some of the bricks were being salvaged, which gives me hope that some pieces of the building will be recycled into new structures. The idea is poetic in a way, as the stones of many of the religious buildings destroyed during the Reformation in England were taken and reused, making the act almost traditional. And the buried treasure? I tried to track down the developers so that it could be recovered, but had no joy. I even sent a tip-off to the ODT in the hope that the professionals might be better equipped to investigate. While the building may be gone, its influence has not quite disappeared. As long as Wesley St is known as such – the name having been bestowed to reflect the presence of the church – it will serve as a reminder of what once stood on this corner. And below, perhaps, a buried treasure awaits another hundred years to pass before it is finally unearthed. Thank you for outlining the history of this church. I have wondered about it when driving by! 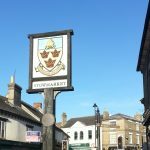 A terrific post and thank you so much for writing it and maintaining the history of this church. Vital stuff. I get the difficulty faced here by churches with declining congregations and ageing, expensive buildings to maintain to ever-more demanding standards. Churches aren’t really in a position to spend the sums of money required to keep bricks and mortar standing. Indeed many would argue that they should be spending their resources elsewhere in good works and looking after the needy. All valid arguments. But something is being irrevocably lost here. Something is gone forever and can not ever be replaced. 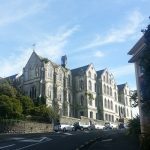 How much does Dunedin and its citizens, present, and past like me, care enough to maintain its heritage? 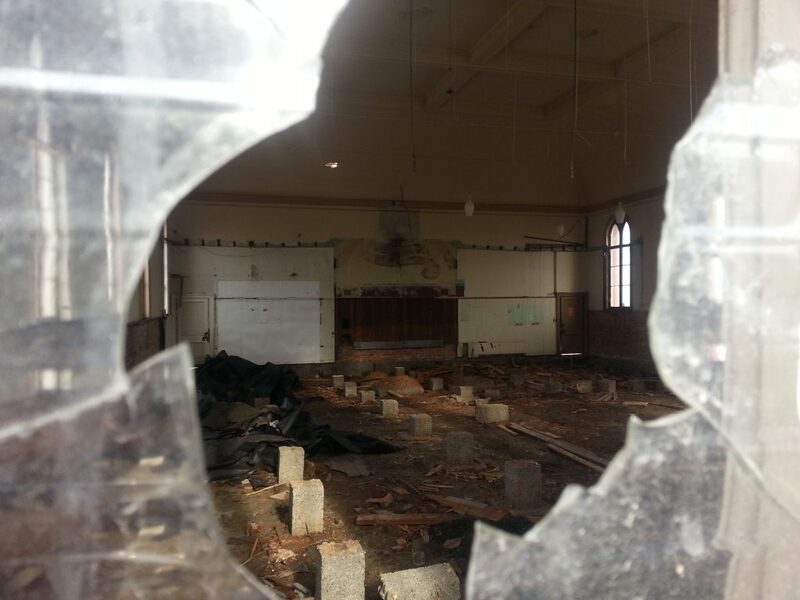 When I heard about this for the first time I posted on Facebook on how sad the destruction of this church made me feel, and someone replied along the lines of, “Well, if you care so much about the building why don’t you buy it”. Lazy snark and provincialism all in one comment! My ancestors attended this church: marriage, funerals and baptisms. Just like thousands of others. The building may have little or no architectural merit – I simply don’t know. But it will have memory and meaning for many people who had significant life events within its four walls. Not sure what the answer is. Perhaps a fund to help maintain these buildings or at least part of them in some way. There must be options other than complete demolition. But ratepayers, citizens of Dunedin, must ultimately decide how much of their past they wish to preserve. Much is being done but much is also being lost. Thank you again for writing this post. I have retained a local copy so that I can preserve the memory of some of what is being lost. It is a good history of this church and I learned plenty. But it omits the fundamental problem that meant the church was doomed. It was affected by both the September 2010 and February 2011 earthquakes with cracks appearing in various places. It was deemed as dangerous after the 2011 earthquake and repairs to bring it back to usable space were prohibitive. I dont know anything about the history, but I work across the road right next to where it was and I cab tell you one thing, it made dust for miles when it dropped. So many people have commented how they now get lost in South Dunedin when driving because they used the church as a landmark. Very sad to read of this. I remember as a child going with my grandmother and aunts to attend church. Family weddings and funerals also are prominent in my memory. I was a bridesmaid at a family wedding there. 1944. Will add that a distant relative Rev Cornelia Grant was minister here early 2000. Sorry it has gone and it will be missed by thousands who used to drive by.